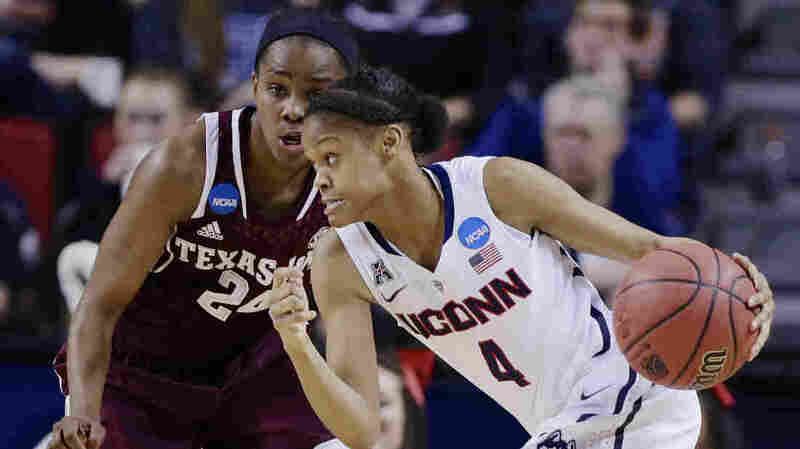 Who Will Join UConn And Notre Dame In Women's Final Four? : The Two-Way Maryland plays Louisville and Stanford faces North Carolina tonight. The winners then head to Nashville for a chance at the NCAA women's basketball championship. Two undefeated teams are waiting. Connecticut's Moriah Jefferson drives past Texas A&M's Jordan Jones during Monday night's game in Lincoln, Neb. Connecticut extended its unbeaten streak and is headed to the women's Final Four. Two undefeated teams are waiting to see who will join them in Nashville on Sunday as the NCAA women's basketball tournament moves toward its Final Four championship round. Monday night, the University of Connecticut extended its undefeated season — beating Texas A&M 69-54. UConn, the No. 1 ranked team in the nation and the defending champion, has a 38-0 record this season. If UConn wins the tournament, it would be a record ninth title for the team. Also Monday, No. 2-ranked Notre Dame beat Baylor by a score of 88-69. Notre Dame is 36-0 this season. Tonight, Louisville plays Maryland. The winner will go up against Notre Dame on Sunday. Also tonight, Stanford plays North Carolina. The winner of that game would face Connecticut on Sunday. -- Louisville was ranked No. 4 in the nation according to The Associated Press. -- Stanford was ranked No. 6. -- Maryland was ranked No. 11. -- North Carolina was ranked No. 12. The women's championship game is set for next Tuesday in Nashville. "The past three seasons, UConn and Notre Dame have faced off in the national semifinals, while being rivals in the old Big East. This year, with Notre Dame moving to the ACC and UConn in the new American Athletic Conference, the two Goliaths did not meet in the regular season. But they have been steadily moving closer and closer to what would be a historical showdown in college basketball. "Certainly, neither one of them is going to be looking at that matchup now; they both still have to win one more game to get there. And these are two programs that are extremely disciplined about not getting ahead of themselves — even if a lot of fans and women's basketball observers have been thinking about their possible showdown for months." The men's Final Four gets underway Saturday in Arlington, Texas. Florida, the No. 1-ranked team in the nation, plays No. 18 Connecticut. Wisconsin, which was ranked No. 12 at the end of the regular season, plays Kentucky — which wasn't among the top 25 teams going into the tournament, but was a preseason favorite of many to win the title. The men's championship game is set for Monday.